Wayne Kenneth Baldwin, 87, years old passed away on Feb 3, 2019 at King Veterans Home, after a long battle with Lewy Body Dementia and Prostrate Cancer. Wayne was born on December 18, 1931 to Kenneth and Alice (Odell) Baldwin in Madison, WI. He married in 1951 to Donna (Anderson). After many years of marriage, they divorced but remained friends. He is survived by Kathy Wahl (Rick Brewer), Sue Faga (Curt), Gene Baldwin (Susy) and Julie (Mike) Bowers. 11 Grandchildren, 18 Great grandchildren and 1 great-greatgrandchild. Donna Baldwin, sister Joan and sister in law Suk Ye, many nieces and nephews. Preceded in death Kenneth, Alice, Bruce Jon, Joyce her husband Richard. In lieu of flowers, please donate to King VA Ainsworth Hall Activities (Wayne Baldwin), Heartland Hospice or Spiritual Care VA King, WI. As a young child he had several brushes with death, he was kicked in the head by a horse and almost drowned twice. Wayne even as an adult never learned how to swim. As a young man he delivered newspapers and entered in a soap box derby winning first place. At the age of 14 he got his first job as a mechanic, he could take an engine apart and put it back together, he could build a car from the ground up. He impressed his boss so much that when other shops would try to steal him away, he wouldn’t even let them talk to him. Wayne’s dad was a truck driver, he would ride along with him - one day his dad said, “Wayne it’s time you learn to drive a semi.” His dad pulled over put Wayne in the driver seat and that’s how he learned how to drive a semi, he was 14 years old. Wayne could drive any vehicle needed and could also repair them. He used to talk about all the beautiful architecture in Europe and how devastating it was to see it get destroyed. After he returned from the overseas, he wasn’t sure if he wanted to be married so he took off for California (today they call this post-traumatic stress). When he returned to Wisconsin, he and Donna picked up where they left off and started their family. The Family went on many trips fishing and camping all over Wisconsin, always roughing - it no bathrooms, no running water. In 1967 and 1968, we went to Canada for 3 months during the summer, these trips where really roughing it, 40 miles to the nearest town. Wayne had taken an old school bus and remolded it into a camper, in the summer of 1969 we took a trip out west and visited many states and we would stop at every Historical marker he would have us read them, then 5 miles down the road he would have us tell him what it said if you didn’t read it he would turn around and have you read it again. So, you made sure you would read it the first time. His favorite time of the year was Christmas, we never received much, one year it was a roll of pennies another year it was a brick with $10 taped to the bottom. We wouldn’t get our Christmas tree until Christmas Eve, he would always decorate a table with garland, a huge bowl of fruit, nuts and his famous peanut brittle. 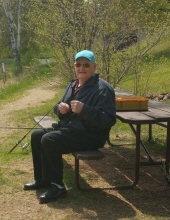 His Family had always called him a gypsy I guess that is why in his 50’s a house was built in St. Germain to retire in, but he sold that and moved to Ohio, came back to Wisconsin and lived with his daughter Kathy for a while then to Wausau where he did what he loved most: Fishing. He was fishing with a friend and the boat capsized, he lost everything - tackle box, poles and his wallet almost drowned. Did I mention he didn’t know how to swim? Wayne was a jack of all trades from building a computer to building a house to fixing anything on wheels. He spent most of his life as a mechanic. His last job before retiring didn’t want him to leave because he could read and understand contact so they would have him assist in all the bids and contracts. Wayne did have one issue that was spelling and phonics, he also had Dyslexia back in his day they just would say they were dumb, but he was far from that he could read or look at something and fix it or tell you how too. In 2003 he was diagnosed with prostate cancer, he had a will to live; then in 2016, he was diagnosed with Lewy body dementia, this was very hard on him because he understood that he would lose all his knowledge. He used to say that his brain is a fart. We would have to keep saying this is part of your illness. Even to the end people around him could laugh. Even in the end his favorite thing was his fishing poles and equipment. To send flowers or a remembrance gift to the family of Wayne Baldwin, please visit our Tribute Store. "Email Address" would like to share the life celebration of Wayne Baldwin. Click on the "link" to go to share a favorite memory or leave a condolence message for the family.